We’re fast approaching the end of summertime and I’m sure you’ve had some wonderful vacations. But how do we deal with that post-indulgence funk we find ourselves in at this time of year? Even if we haven’t taken a trip anywhere particularly exciting, we catch ourselves being unenthusiastic about cooking healthy meals and going to the gym. It can take most of the fall to get back to our old selves, and that’s why I created this episode. Putting ourselves through a cycle of shame and regret will not help us get back to the person we were in a hurry. Instead, I’m providing some scenarios and small mental exercises, helping you ask yourself the right questions in getting to the bottom of the negative thoughts that follow summer. Tune in this week to turn the second half of the year around, getting excited about the workouts and wonderful wholesome foods that are waiting for you when you come home. This is something I struggled with for years, so I’m sharing my favorite turnaround tactics for when you’re feeling off-track with your health and fitness. If you’d like to dig into this method of evaluating your results on anything, download my all-encompassing worksheet to move towards the results that you want to see in your life. Why being “off track” is nothing more than a thought. How vacations affect our ability to sustain solid food and movement rules upon return. Why our brains love all-or-nothing thinking in difficult times. 3 great questions to help assess where you are post-vacation. The role compassion plays in this process. Why judging ourselves gets in the way of our ability to make good choices. Oh, good morning, empowered leaders. How are you this morning? I have a big dose of encouragement for you today. Get your coffee, get on your walk, continue on your commute. Wherever you may be this morning, listen in. I cannot wait to share this topic with you. What I’m walking you through this morning is my favorite turnaround tactics and philosophies when we feel off track or just aren’t feeling it; not as motivated as we’d like to be around food and exercise. And remember, feeling off track is really just a thought which creates a not so great feeling, so even stop right now to think about it. When you think the thought, “I’m off track…” How does that feel? We’re all different, but I can already feel myself saying, “Ugh…” Like, a little bit of disappointment I’m off track. So lean in and find out how to turn things around really quickly. And what would it be like to not ever really be off track? 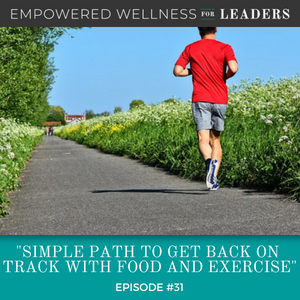 This is going to be the finale of this episode; how to stay more steady with all the ways of taking care of your health and eating and exercising. Summer brings us a time of more relaxed schedules, family vacations, and a lighter calendar for most of us. Or for you – I’ve heard this from several people I network with – it’s their busiest time with work and the kids are now home, so it’s really distracting. So you’re relieved that they’re back in school and in a routine, you know, for you. But are you feeling a little off track with your eating and moving routines as we move from the slow longer days of summer to the fall activities, when kids get back to school? Even if you don’t have kids, the schedule is different when they come back from vacation; the challenge is real. What I’m offering today is a process that can be used to turn anything around once you feel and start thinking you’re a little off or off track. I’ve started using the process I’m sharing today around all things, but for today, let’s stay focused on food and exercise. So I’m making a bit of a leap here in assumption that you might be off track. Don’t tune out if this isn’t where you’re at today because this evaluation process is useful to tweak and just empower and really change the way that we approach our results. When we get off track, I want you to remember that it all starts with changing your thinking, and that’s where we’re going to start. This is the scenario; you’re rocking along, hitting the gym three to four times a week, and you’re even doing yoga some mornings. You’re shopping fresh, cooking a bit, and found even a new restaurant where their takeout is lean, green, and awesome. You’ve dropped a couple of pounds, your energy is amazing, and even though your work can be pretty stressful, you’re not only on top of your projects or closing deals this month, you’re enjoying your work. Everything is rocking, but now, it’s time for vacation. I’m going to continue with those assumptions, but just so you can really – I’m painting a picture here; hang with me. You’ve been on a couple of trips now this summer and they were amazing. The food in Italy was over the top and even that family vacation at the beach with all of your extended – yes, it included your mother in-law – with that extended family was so much fun. But you’ve noticed that as you’re back in town, your energy isn’t the same. You missed your favorite workout class last night that you usually love to do. And who wants to cook now after being so well served on vacation? It’s so much work. What’s up? Why aren’t you feeling motivated anymore around food and movement? It was rocking during the spring, right, before this disruption; what is happening? Can I say just quietly here, it is all in your thoughts and you just might be judging yourself for the way you’ve been eating and drinking. And now that you’re at home, are you mad that you gained weight after all that hard work? If that’s you – if any part of this is you and getting your attention, let’s start by regrouping right here. There are a few simple steps. Get curious, give yourself some compassion, then evaluate what’s going on for you through a positive and helpful lens by asking three great questions. But first, the most important key to turning things around and back to your healthy, engaged, and confident self is curiosity; yes, with a little bit of compassion. Have some compassion that changing gears to and from vacation is natural and there really is no such thing as good and bad behavior; for real. But when we start judging ourselves for how we’re behaving, it gets in the way of making great choices. And there really is not good and bad food or a perfect workout routine; it’s really true. You’ve done nothing wrong. You’ve had a good vacation, for goodness sake; a well-deserved one for sure. So, it is so simple to bring things back. Add a dose of curiosity by really asking some great questions. And instead of starting off with what went wrong and what a loser you are because you gained some weight or you’re just not as motivated, start with asking what did work. What went well during this off-track season? Even, what is working now? Was it cooking more at your rental home? Did you notice that you really just love that during vacations? All the walking and activity in Italy – you like walking; you’ve even brought that home a little bit. Or that you actually did do yoga, no matter where you were? Do you see, what did work? Oh, and running in Italy, even though those cobblestone streets were a little treacherous, you loved the scenery. And even on reentry, what’s working with all the ways you’re taking care of yourself? Remember, our brain loves all or none thinking when we’re in a negative space. So take some time here to, again, “What is working?” what might be really true is you’ve been walking quite a bit since you returned and you’ve even duplicated some recipes from your trip and realized you can bring Italy home with you. You have continued to do yoga every morning. Do you see all the things you came up with? Your brain, when you go to this space of I’m off track, it feels like we’ve done nothing, and that’s why you want to start with these positive questions. The brain wants to think that everything fell apart and that we’re doing nothing towards our goals, and it’s absolutely a lie. That’s why this process is so important. So first, what did work? And now, move what isn’t working well; the wine. You notice you were really groggy and bloated when you drank through the evening. You didn’t do any strength training while away and now you’re worried about getting back to the gym, you know, a little embarrassed and really worried about getting really sore. And now, you love having wine every night after learning so much about them in Italy. You’re walking, but you’re not getting those sweaty fun workouts in that you love and you’re leaning way too much into takeout food. Our brain loves all or none and we’ll trend towards the negative. Start with what did work, no matter what you’re evaluating, then process what didn’t. it’s so backwards from what we would normally do, right. We spend all this time judging ourselves for poor behavior during vacations and on our return, we’re even creating more resistance, more blame, and we literally shut ourselves down. It takes most of the fall sometimes to get back, and that’s why I created this episode. You don’t need to do that. You just stop right here. It will be natural to focus on what you did wrong or what’s failing and just stop with these gentle questions; what really did work? What is working right now and what isn’t? Then, what do you want to change, what do you want to do next? Alright, so this would be an example from what I’ve shared, even though you loved all the physical exercise you were doing this past spring, you realized that six days a week is too much. You’re really sore all the time, so now you’re setting a five-day minimum to your workout; you’re not making yourself go six out of seven. Or you realize that yoga covers both your physical and mental health needs, so you’re adding two classes to your week. Wine is awesome, but you’re going to reserve it for weekends. Now, remember, working out more consistently is helping your energy, so now you’re committed to not skipping classes and you’re going to pack out your gym clothes and clear your calendar on those favorite gym nights. You see a busy fall ahead, so you’re going to take advantage of a grocery shopping service so you can still enjoy cooking at home. This really works; taking time to shift your brain into a positive space by evaluating what worked first. Then process what’s not working for you and then let your brain come up with that really delicious plan, moving forward by asking those questions. When we do this with a positive lens, when we evaluate our results in a positive manner, then the plan we make going forward is not a should – remind you of a podcast episode a couple ago? It results in a specific great plan that works for you right now. It gives you those next steps. It gives you inspiration instead of, “Oh my god, I can’t do this…” And you’re making yourself go back. It’s inspirational. It’s really been working for me. You can use this to evaluate sales calls, you can use this to evaluate how your day went, you can evaluate meetings with your boss. You can evaluate the way you’re taking care of food and or exercise. If you’d like to dig into this way of evaluating your results on anything, just check out the show notes, dianamurphycoaching.com/31 and you’ll have a worksheet. I’m making more of this a habit for me and it’s really making results and working towards what I most want in my life and business more fun. Well, I have more for you here. What would it be like to eat more consistently all year round? What would it be like to stabilize your weight and not have to be good all week so you could have fun on weekends? What would it be like to barely gain two pounds on vacation and not have to work so hard to lose it again when you get home? I have those answers too. Of course, that is a lot of the work I do in my coaching practice, but what’s really cool is it’s happening for me in my real life. Shift what you believe and think around vacations and weekends and time away. Stop right here and ask, what do you believe around food and exercise when you think about weekends and vacation? I mean, there are really great slogans that are made out of this, “Weekends were made for Michelob.” That’s an old one, but do you see how these thoughts really create actions and choices? So, do a thought download on these. Let them flow. Write down all of them when you get a chance, and you’re going to see why you make certain choices over the weekend. And what’s really fabulous news – that’s just thoughts that create a feeling state that creates a desire to eat or drink or make those choices. So use these prompts – and this will be in the show notes as well – “On the weekend, I handle food this way. On the weekend, exercise. On the weekend, I can. You know, play around with this. Thought download anything and everything around food for weekends and exercise around weekends. And it might be different for you during vacation, but sometimes I feel like it’s very much the same – at least my belief system was the same – that the way I thought about weekends went on overdrive when I went on vacations and it was like more days of it, so it was much harder to get back on track. And I usually gained a lot of weight. Or, “I feel guilty working all week away from the kids; I can’t work out on weekends.” How did any of those statements or thoughts make you feel? They all create an apathy or resistance to staying consistent with what we have set and worked so hard for during the week; our normal routine and they create an energy that wants to eat. Most times, when we’re saying, oh weekends are made for just being off-plan, we kind of start thinking of French fries and beer and pizza, when in reality, we don’t even really have an appetite for that. we’ve created the appetite with that thought. What’s really tricky is when we think food is to celebrate, we ignore any sense of our appetite and feel the pressure that I’m talking about here to overdo it. Remember, every thought creates a feeling, even a vibration. It’s either, like, some cause a big vibration and a push, I find that in my life some create calm, like I’ve got this, calms me down. And when it’s full of lots of energy around food or exercise, our brain almost pushes us to do it or convinces us that the couch is where we need to be all weekend. So the power is, where you get empowered, when you take your power back, when you start feeling more confident is helping you be aware that they are just thoughts. You can turn every single one of them around. But wait a minute, maybe you’re a little bit like me. My belief around food that created weight gain for me was all around many beliefs. The core one was that as I was growing up, when we dine out, when we’re on vacation, food is absolutely celebration. It’s almost an Olympic sport. And the other thought or belief was, I can have everything and anything I want all the time. That’s what the weekends and vacations or dining out was for. I was trained in those beliefs in childhood. We all have different ones. They bring up the ones about empty plate, they bring up anything that we habitually do, kind of in our subconscious, suddenly affects all our actions and decisions around food and exercise. During what I’ll call my maintenance journey around weight, I had lost all the weight, I had lost all the weight, but I knew I needed to learn how to keep it off. That was my second year of Weight Watchers actually. And it was more creative than just following the Weight Watchers plan and I knew it because I was changing my thoughts. It wasn’t what I was doing, it wasn’t the diet, it wasn’t the workout plan, because since then in these 12 years, I’ve shifted and changed my workouts and food a lot. Seriously, it’s not about action, it’s about what you’re believing. These are my new ones and they are fabulous and kind of what I lean into now. It took a little practice. Another was that I realized I hated making up for off behavior, so I stopped big overeating. I stopped giving myself permission to eat and eat and eat until I had to loosen my pants. Another was, I decided that I’m going to decide when I want to enjoy an adult beverage. It could be – for now, like, it’s fine wine, really with food, not just as a habit, and to not always join in when others do. This was a challenge when I was with my mom during five o’clock society. They go to dinner, but they go very early and it’s all about the drink they have beforehand. And so I really need to decide that I’m just not going to join in because it’s offered. Remember, that’s a thought. Now, that’s a new way I do things. Alright, here’s another; I know that I love working out on Saturdays. I really do. I have my favorite class, and if I’m in the mountains, I always plan something very special for myself on Saturdays and I do rest on most Sundays, so that’s my new belief and thought. I love active errands on weekends. We walk whenever we can. I now love cooking. I don’t resist it. I used to. It’s actually learning a creative release for me if I plan ahead a little bit, pick out a fun recipe and give myself enough time to shop. And I don’t do it all the time, but I know that it is a great let down; it’s a release. Alright, I have practiced this new thinking so much. Did you notice I love doing some of those things? That’s what changing your thinking to a new thought and practicing it becomes, “Now I love doing those things. They’re part of my personality now.” But they’re not; they’re a new belief. What would you like to practice thinking around this? As you choose a new way of doing vacations and weekends, it will take some practice. I notice this urgency on weekends. It’s like, “Oh, it’s time to have the hamburger and the pizza.” And I’m like, “I don’t even want that. why do I think that?” And just these old thoughts can come up. But you just nip them right in the bud and offer the new way you want to think about it; not judgment, just a new way of thinking. Interrupt the old, bring in the new. New thinking, new believing, equals new results. And I have maintained my weight for 12 years. I even go on cruises and the most I gain is a pound. Now, I have to be really deliberate before I go and not get in vacation mode and cruise mode, for sure. If I follow the environment, guess what – it’s going to happen. I will gain at least five pounds. But I go with my intentions and my thoughts and beliefs that work for me, and they are, I’m not going to eat until I’m hungry, no matter what, and I’m going to stop when I’m lightly full. And it really works. It works for my whole life, but it really works when I set that intention when I travel. So ask this question to help you create your new thoughts around food and activity; what would healthy vibrant person do? See what that very smart and insightful brain comes up with. Ask really great questions. You’re going to find out what your new beliefs are that are kind of yours. Another is, what would my future self that already has lost 30 pounds do? If that’s you, five pounds, 30 pounds, whatever it is, what would your future self that never gains weight on vacations do? What would that person do? Come up with some ideas. Or I love this one – I did this a lot when I was first losing weight – what would a naturally thin person do? And it kind of broke some of my – I wouldn’t eat just because it was noon. I wouldn’t eat just because everybody else was. Have you noticed, naturally thin people very easily say no? But they also very easily eat a hamburger when everybody else is eating a salad. They do what they need and want in those moments. And the last – I love this one – what do I want to think about food? As it relates to what we’ve talked about today, what do I want to think about food when it comes to weekends and vacations or dining out? When we change what we believe and think about ourselves – that’s why I love confidence building and confidence mindset work, and about the important issues in our lives, it makes them effortless. Notice things that are, like, getting you off track, like we talked about today, and go through this process. What is working? What isn’t? And what would you like to do next? And then even coming up with one or two new beliefs. I’ve also taught some very powerful tools to go along with this new believing and thinking, and this is what really works for me. Grab episodes 9 through 12 if you’re new to my podcast. This will lay down the basics of learning how to not do good health from your head and an eating plan, but from an intuitive more natural space. It’s less to think about all around. Alright, I’ve got something really special brewing. I haven’t designed every detail yet, but I’m doing a free training this fall – be the first to know. You can sign up for the link for that free training in the show notes; dianamurphycoaching.com/31. Can you believe it, 31 episodes? I am so stinking proud of myself. And I’m going to end today, what are you so stinking proud of with yourself around anything? Let that be your motivation to apply what you learned today and get moving forward. I love bringing this to you and I hope you have a fabulous day.